ALPINE ROMANCE, is a custome crafted, true log cabin offering everything you could ask for in a mountain getaway and much, much more. Enjoy the Peaceful and Beautiful surroundings of the Smoky Mountains while enjoying a Fully Equipped Kitchen, Stack-Stone Gas Log Fireplace and 4 Flat Screen TV's each with Satellite. The Master bedroom has a Queen Size Log Bed with private bath and Jacuzzi while the Second Bedroom offers a Queen Log Bed with a full bath. 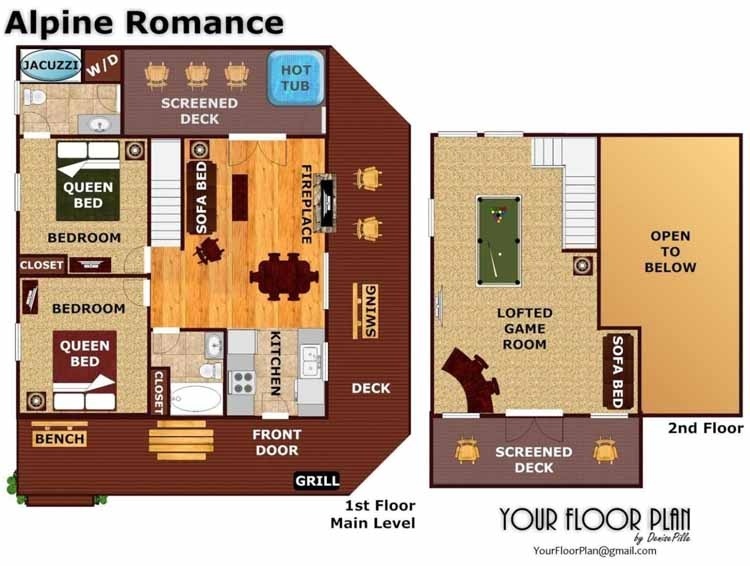 "Romance" is equipped with 2 Queen Size Sleeper Sofa's; one on the main level and one on the spacious 2nd level open lofted game room with DVD player, Domino Table, Pool Table, Poker Table and wood bar with stools. Alpine Romance has a screened in Porch with a 5 person Hot Tub and a porch swing on the open deck next to rockers overlooking the summit of beautiful Mountain Views. Make plans now to stay in Alpine Romance - just minutes from Gatlinburg and Pigeon Forge! I loved this cabin! I will be back for sure. The cabin was lovely. It was spacious and very clean. We would definitely stay again. It was such a beautiful cabin and it was up kept very well. I would come back if I have a chance. I had no problems while staying everything went well and we will continue to use these cabin rentals again. Beautiful over all. We had a wonderful time, being from Florida (flat landers) at first the road in seemed difficultbut we quickly got the hang of it, and it was centrally located between Gatlinburg and Pigeon Forge.Beautiful views from cabin, very relaxing! The cabin and setting was beautiful and so relaxing. The furnishings were comfortable and clean. There were some issues with ceiling fans that were broken and not functional but maintenance responded very quickly even though they ended up needing to be replaced. Overall it was a great experience and we would definitely stay here again. We booked online last minute, but was very pleased with the cabin and the cleanliness. We have stayed with American Patriot Getaways before and have always been pleased, that's why we continue to stay with APG. Thank you very much, we had a great time andhope to return soon! Cabin was well-furnished and beautiful. The view was nice, but we prefer a little more seclusion (which is becoming harder to find :). Consider getting wifi. I couldn't rate staff friendliness since everything was automated or online...which was fine withus. Check-in/out was quite convenient and efficient. Thanks! Your cabin and our stay with you was superior in every way. From the first person I spoke with to find the right property for us, to the moment we left, was exceptional. This was our first experience with American Patriot Getaways, and APG deserves our highest marks for staff, property, cleanliness, and value. Thank you for a memorable vacation! Overall, my family had a great time. The propane grill did not work but we were given a charcoal one to use. Thank you for a nice experience. We had an amazing time as always, although it rained the entire duration of our stay. We made full use of the hot tub and pool table. The gas grill was great to have instead of charcoal. The deck has some boards that need to be replaced, however,it didn't bother us since it was on the uncovered portion of the deck. This cabin offers amazing mountain views that with all the rain they appeared to be smoking. Gorgeous! No major problems. Just a couple of small items. There was no chalk for the cue sticks. There were no instructions for use of the DVD player. The hot tub was overfilled so a lot of water spilled out when we got in. Otherwise, a great property. This is the 5th time I have stayed with Patriot and I have always had a good experience. This cabin was in a new resort area and it was very private and quiet. The deck and views were wonderful. The only issue was the sulfur in the water. I grew up in a rural area that had well water and I know that sometimes sulfur is a small problem but at this cabin it was really bad. Showering in rotten egg water was a huge challenge. Brushing your teeth with it was impossible. This was a difficult thing to overcome but overall our stay was enjoyable. I have stayed in better with Patriot. My sister and her husband stayed with my husband and me this past weekend in Alpine Romance. The cabin was beautiful...all the comforts of home and then some!! The view from the front deck of the cabin is amazing. Absolutely loved the 2 screened in decks.The stay was private and peaceful, giving us the quiet time that we needed. We will definately stay in Alpine Romance again. We had a wonderful time in a terrific cabin with a wonderful view! It was pretty secluded, so we had lots of quiet to enjoy time with our family. We will definitely look to American Patriot Getaways again for future cabin needs. We would have loved tohave a recycle bin/container of some sort. I hate throwing recyclables away. We also had to make a run for dish soap, and we had to wash the one dish towel because of the length of our stay, but other than these things, everything was really great!